Posted 3/17/2016 8:07pm by Judy Lessler. Finally, we have greens. We will be at the Durham Farmers Market on Saturdays with Braising Mix, Chard, Lacinato Kale, Siberian Kale, Sweet Potatoes and our famous, heirloom Bloomsdale Spinach. EVERYTHING is certified organic. Posted 1/28/2016 12:46pm by Judy Lessler. We are proud to announce that as of January 2016, Erasmo Flores and Rene Rios became partners in Harland's Creek Farm, LLC. They have been in management training for a number of years. In fact, after Judy fell and broke her shoulder in June 2016, they took over all the day-to-day management of the farm for many months. This is a big step for the farm, and we are proud we were able to achieve it. As you may realize, Hispanics work on many farms, but few become owners. Rene and Erasmo have done lots of studying and taken on more and more responsibilities over the years. They both come from farming families. 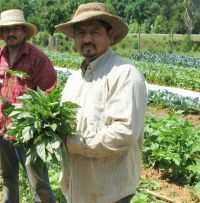 Rene is married, has three children, and lives in Pittsboro; Erasmo and Yoli are parents of Michael and Ernesto, and they live in Siler City. The other owner, Judy Lessler started the farm in 1999 with her husband. She is now widowed and has 5 grown children and 10 grandchildren. Judy lives on the farm site. We will celebrate this partnership when the weather gets warm. Stay tuned. Posted 9/29/2015 12:34pm by Judy Lessler. We are proud to report that we had our organic inspection on Monday September 21 and passed without a problem! I was very proud of Rene and Erasmo; they handled most of the interviews for the first time, and did a great job. I still do most of the computer work and will probably do so for a few more years. I spent 30 years working as a statistician and have used spreadsheets since the first version available, which was called Visi-Calc. Rene and Erasmo have learned many things, but it is hard to match the efficiency of someone who has had 40 years of experience with spreadsheets and data bases. Posted 7/28/2015 10:58am by Judy Lessler. Last winter I bought the two-volume Cambridge World History of Food. Each volume is over 1000 pages long and printed in two columns and in about eight point type. There is a huge amount of information available in these volumes. The nutritionist, historians, horticulture experts, and botanist who prepared this book recruited a large number of authors to write various sections. The book is well researched and has lots of references. You don’t need to buy one; call me if you need to know anything about any vegetable. We grow potatoes on Harland's Creek farm. Potatoes are considered as staple food throughout the world. The editors of this book divide staples into two groups. The first group is grains and includes amaranth, barley, buckwheat, maize or corn, millet, oats, rice, rye, sorghum and wheat. The starchy staples includes bananas and plantains, manioc, white potatoes, sago, and sweet potatoes or yams. Potatoes are the fourth most important staple food. They evolved in the Andes and spread throughout the world. Different varieties of potatoes are found throughout South America and Central America. There are over 200 different varieties of wild potatoes. It’s not clear when potatoes began to be domesticated because hunters and gatherers also assembled stocks of potatoes from the wild. In Peru and Bolivia, there’s evidence of their use as a domesticated plant between 10,000 and 7000 years ago. In South America, there was a vertically integrated production system in which quinoa and corn were grown at lower altitudes and potatoes and other tubers grown at higher altitudes. Llamas were raised at the very tops of mountains. There was communication between farmers at the various altitudes, and crops were traded with the llamas being used as the "beast of burden." Sir Francis Drake is credited with bringing the potato to Europe. There is however some doubt about that. He did write about the potatoes on his round the world voyage which lasted from 1577 two 1580. The potato spread throughout Europe and was such an important crop, that it is credited with the elimination of famines by the early 19th century. Potatoes were cheaper than wheat bread and could be grown on small holdings. Combining potatoes, some greens, and flesh from farm animals resulted in a nutritious diet. One of the disadvantages of the potato is that it can be not be stored for many years the way some grains can. Therefore, it must be planted every year. In some places, particularly Ireland, people became so dependent upon the potato that there was widespread famine d when the potato was hit by late blight. Potatoes are spring crop in North Carolina. 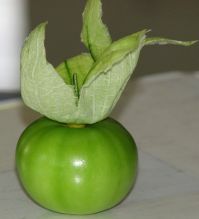 We plant them in late March and have usually harvesting them completely by the end of June. Were able to grow organic potatoes in North Carolina easier than farmers in the northern regions can because we plant them, cultivate them, and harvest them before late blight blows through. Our yields of organic potatoes are as high as yields of non-organic potatoes in northern region. Harland's Creek Farm grows organic red, Yukon gold, and two varieties of fingerling potatoes,. You can buy them at our stand at the Durham Farmers' Market. Posted 5/19/2015 10:07am by Judy Lessler. For years collards were slow cooked to almost a puree. Southern cooks would simmer them with “seasoning” on the back of their stoves. Seasoning was generally ham hocks or fatty pieces that had been trimmed from hams, chops, or loins, and sometimes it was bacon or fatback. Recently, chefs have woken up to the benefits of this traditional vegetable It is healthy and has a robust flavor when prepare raw. This version of the recipe calls for using Tahini Sauce as the basis for the recipe. Harland's Creek Farm suggests that you make the Tahini Sauce and store it in your refrigerator for use with greens all spring long. News Alert: I have been telling people that the stiff leaves on the green garlic are not edible. Yesterday, I remembered that Chef Justin Meddis of Roses Meats and Sweets in Durham told me that he put them in stock. As I prepared to slow-cook a chicken I had purchased at the Apex Farmers’ Market, I decided to put it on a bed of stiff green garlic leaves. When the chicken was done, I scraped up the fat-infused leaves and discovered that they were soft. Soon I had eaten them all with a bit of salt. I did not even wait to spread them on toast or crackers. They were delicious. Wind. I have been reading all about weather. Aristotle wrote Meteorology in 350 BC and discussed wind. He ridiculed people who thought that wind was moving air; rather, he taught that wind was a substance, like an invisible smoke, that was exhaled from the earth. In those days, the main natural philosophers used logic and deductive reasoning rather than observation, experimentation, and induction. Aristotle said that wind was a dry substance that was exhaled from the earth and that it coalesced and flowed through air similar to the way in which water coalesces and flows from rivulets, springs, branches, and rivers. According to him, a stiff or strong wind is analogous to a rushing or raging river. Posted 12/11/2014 2:49pm by Judy Lessler. Harland's Creek Farm has firewood for sale. It is a mixture of oak and hicory and is harvested from trees that are down in the forests that surround the growing area of the farm. Cost for 60 cubic feet (~0.5 cord): $200 delivered and stacked; $160 you pick up and load. If you would like to order a load send an e-mail to hcffarmers@gmail.com or call us at 919-274-0024.